“The most difficult subjects can be explained to the most slow-witted man if he has not formed any idea of them already, but the simplest thing cannot be made clear to the most intelligent man if he is firmly persuaded that he knows already without a shadow of doubt what is laid before him”. Whenever I work with a client, I know we will make progress when there is a clear, open willingness to learn. To be in this space, however, a person must let go of trying to look good, appear slick and cool or trying to demonstrate how smart they are. To be a good student and to be able to learn all that is available for transformation to occur, a person must constantly practice humility while acknowledging they don’t know all that they thought they did. In fact, the emptier the mind is, the more room there is for learning. 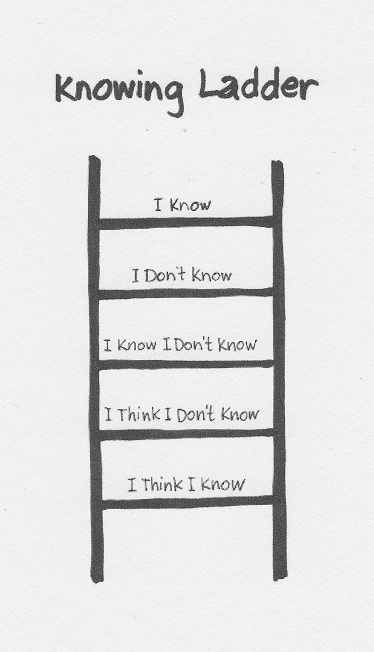 A killer mind-set for learning is the “I think I know” level, which is the lowest level of the Knowing Ladder. As long as a person holds on to thinking they already have the answer, the less open they are to learning and they less they will know..
Once a person releases their grip on that lowest rung of the ladder, they begin to realize that maybe they don’t know. They begin to be open to new possibilities and the road to learning and discovery begins to open. Soon, one realizes that, in fact, not only do they not know everything, but they actually know very little compared to all there is to know on any given subject, never mind about life on the planet. This is indeed a humbling moment, and can be a little scary, because many of us think our very survival is connected to what we know. Once we realize that our survival is NOT connected to what we know we are ready to discover what we don’t know and the road to learning gets a lot easier and more exciting. Soon, the mind opens up, and we see things we never knew were there; we hear things we never heard before and awaken to a new world of possibilities, a world that was always out there, but we never knew was there. When we connect to this level of natural knowing, paradigms shift and lives literally change. It all starts with letting go of that lower rung. Thank you to Pam Larsen for sharing the Tolstoy quote with us. “Imagine that you had won the following prize in a contest: Each morning your bank would deposit $86,400.00 in your private account for your use. However, this prize has rules, just as any game has certain rules. The first set of rules would be: Everything that you didn’t spend during each day would be taken away from you. You may not simply transfer money into some other account. You may only spend it. Each morning upon awakening, the bank opens your account with another $86,400.00 for that day. The second set of rules: The bank can end the game without warning; at any time it can say, it’s over, the game is over! It can close the account and you will not receive a new one. What would you personally do? You would buy anything and everything you wanted, right? Not only for yourself, but for all people you love, right? Even for people you don’t know, because you couldn’t possibly spend it all on yourself, right? You would try to spend every cent, use it all, right? ACTUALLY This GAME is REALITY! Each of us is in possession of such a magical bank. We just can’t seem to see it. The MAGICAL BANK is TIME! Each morning we awaken to receive 86,400 seconds as a gift of life, and when we go to sleep at night, any remaining time is NOT credited to us. What we haven’t used up that day is forever lost. Yesterday is forever gone. Each morning the account is refilled, but the bank can dissolve your account at any time….WITHOUT WARNING. SO, what will YOU do with your 86,400 seconds? Those seconds are worth so much more than the same amount in dollars. Think about that and always think of this: Enjoy every second of your life, because time races by so much quicker than you think. So take care of yourself, be happy, love deeply and enjoy life! Here’s wishing you a beautiful day. Thank you to my dear friend, Mert P. for sending me this.